Garages can become cluttered and chaotic, with bikes, bags, sporting gear and all those things you’re not using right now but ‘might come in handy one day’. 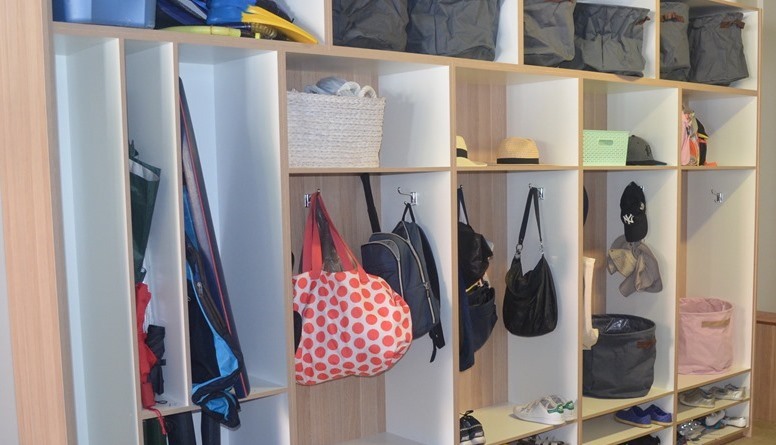 Urban Timber recently installed an open wardrobe system for a Wollongong client, transforming her garage into a place of organisational bliss. “It was fun working together, assessing the space and our client’s storage needs and designing the right solution,” said Urban Timber’s Pam King. “We used an Australian made white melamine faced particle board which is heat and moisture resistant. The robe is backed with a natural oak-finished paneling, and this also ties in with the oak-finished trim. “One of the advantages of custom-designed storage is creating efficient space to store odd-shaped items like boogie-boards, camping gear and tools. “The denim-blue baskets were a perfect addition to store smaller bits and pieces up high,” Pam said. Our client was very satisfied. “What Urban Timber achieved is amazing. The organisation is fantastic. My whole morning has been transformed,” she said. Mudrooms are becoming increasingly popular in new Australian homes. They provide a small but dedicated space near the entrance for the transition between indoors and outdoors. “It’s an ideal room for removing shoes and coats, but also storing bags, keys, hats and other necessary items,” said Pam. “We recently built and installed a floor to ceiling robe in a mudroom for an Austinmer client using a feature grade blackbutt veneer. “The robe has lots of shelving and is perfect for storing towels, sunscreen and other items you need when you’re heading out. “The sliding doors work well because they won’t block the passage-way but keep everything looking neat,” Pam said.